WWDC, for those of you who don’t avidly follow Apple’s annual publicity cycle [for shame! ], is the Worldwide Developer’s Conference. Which is being held next week in California. Everyone’s expecting a new iPhone with slightly better specs, but I’m not quite geeky enough to get excited about wireless data standards. Obviously faster=better, but it’s not suddenly going to persuade me that I can afford to shell out £270 for a phone. What I think is potentially much more exciting is to see new iPhone app demonstrations. That has potential to have a real ooh factor. What I would like to see is an Apple e-reader. I have become more and more convinced that sooner or later we will be doing much more of our reading on some kind of handheld device; much as I like books as physical objects, I have too many of them already. And it would be great to be able to take six or seven books on holiday with me — or just around town — without the bulk and weight of dead trees. And to be able to read newspapers and blogs on the tube. This device doesn’t have to be made by Apple, of course, but I’d love to see what they could achieve if they tried. The only problem is that there isn’t even the hint of a smidgen of a whiff of it on any of the Apple gossip sites. And I suspect that the nice people at Apple have had their hands full recently with Leopard and the iPhone. 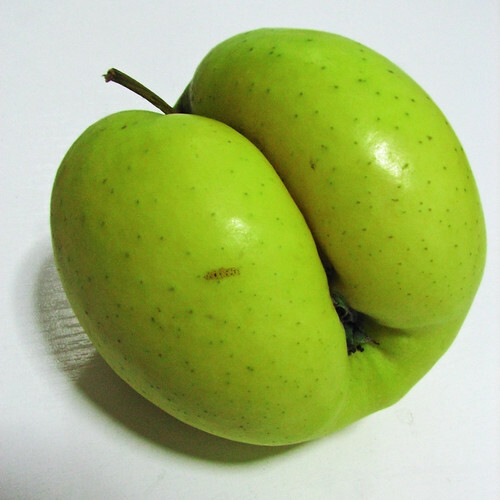 » Transgenic Apple, posted to Flickr by dujarandille. I’s not actually transgenic, I don’t think, that’s just what the photographer has called it. Apple’s new maps: yes, they really are terrible. So what do you want from one of these? Portability, for sure, and browsability probably. Indexing, ability to refer and re-refer repeatedly… I love being able to hit on a random page, or look at the last – and that’s got to be instant to replicate the bookhandling (remember na cGopaleen?) experience. As it is, I absolutely LOATHE reading things onscreen, so anything that makes that more like the calm, quiet, non-glary, independent experience that is books, the better. They won’t ever smell the same though. Oh, and cross-referencing is the one thing they could do brilliantly that books can’t. No, in fact. But I take your point. I suspect that e-readers will never quite have the same strengths as physical books, but they might have strengths of their own. For example, it’ll never be quite as easy to flick through looking for something by eye; on the other hand, you’ll be able to have in-built search. So for those times when you’re trying to find some three-line anecdote or curious fact which wasn’t important enough to get a listing in the index, you could just search for the appropriate word. Because storage space is so cheap these days, you could have hundreds of books with you at once, including for example a full-size dictionary and encyclopaedia for whenever you wanted to check something. Because it could sync with a computer, you could also regularly update it with a couple of dozen newspapers or blogs or whatever. It could also act as an address book and calendar. It could even have wireless internet access so you could browse the net and check your email, although I think that’s not strictly necessary. I broadly agree about reading things onscreen; apparently ‘electronic paper’ screens, which you read by reflected light (like a book) as opposed to being backlit, are much better in that regard. I’ve never tried one. That’s what the Kindle uses, and it looks sort of grey and old-fashioned at a glance, but apparently it works well. Apparently you can easily use it bright sunlight — like a book — which is one problem portable devices have always had. One advantage of it being made by Apple is that it would not be as hideously ugly as the Kindle: they wouldn’t have allowed that out of the door. Again, contrasting with the Kindle, I would probably favour a full touch-screen interface (like the iPhone) rather than a physical keyboard, just because the more screen space the better. And whereas the Kindle tries to make a virtue of the fact it’s a self-contained device that doesn’t connect to your computer (it downloads books wirelessly over a free high-speed mobile phone connection, which is admittedly kinda cool), I would prefer it to sync up with my computer so I could, for example, download books from Project Gutenberg and use those.